During a Dress Up Night at a local school in Cameron, MO, children dressed up in their professional attire of choice. For the grandson of Kearny Rural Carrier Joe Biggerstaff and Cameron Postmaster Christi Biggerstaff, the decision was easy – he wanted to be just like his grandparents. The daughter of Cameron Retail Associate Nick Taylor also participated in dress-up night, and chose to wear postal blue, just like her father. Affirming its long-standing commitment to help find missing children, the U.S. Postal Service® issues this new stamp to make members of the public more aware of the ways they can assist-and to offer hope to the families of missing children as they continue their search. More than 460,000 reports of missing children were made to law enforcement in the United States in 2014. Fortunately, loved ones have reason for hope: Increased public awareness, training, laws, and technology have led to more missing children coming home now than at any other point in history. For three decades, the U.S. Postal Service has also been honored to help with the search, cooperating with the National Center for Missing & Exploited Children and Valassis Communications, Inc., on a program that features photographs of missing children on advertising materials delivered to millions of American homes. To date, about 1,900 of the nearly 3,300 children featured on these mailings have been recovered, at least 157 as a direct result of this program. In addition, the U.S. Postal Service publishes photos and information about missing children in the Postal Bulletin, which adds some 700,000 employees to the search effort. 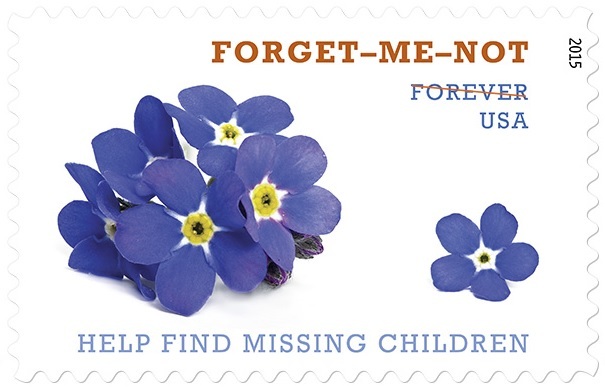 The Forget-Me-Not Forever Stamps are now available at usps.com/stamps, at the Postal Store, at 800-STAMP24 (800-782-6724) and at Post Offices nationwide.